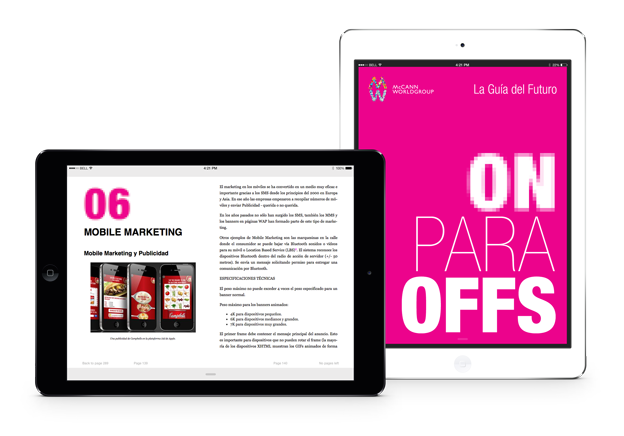 ON FOR OFFS – The Guide for the Future is the training and transformation plan I developed for McCANN WORLDGROUP Spain. Train all employees in the discipline of digital marketing, strategy, design and technical development in order to give the best service possible to the companies clients with the growing and changing digital landscape. Over the period of 5 years, 2007-2012, I was the responsible learning manager in Spain and planned, designed & executed this both cultural and corporate transformation. Due to its success and strategic knowledge captured in the book, it was requested by learning officers around the globe and adapted by them locally. During this time more than 400 employees in Spain were trained. I conceptualized, wrote and designed the book “ON FOR OFFS” leading the internal process of peer learning. Within its almost 400 pages, the book contains a wide range of online-related topics both for beginners and advanced readers to understand this new environment our consumers live and communicate within. The contents are especially designed to suit the necessities of both advertising and marketing agencies when creating campaigns within focus on digital media and channels. Between 2008 and 2012 I continuously updated the book converting it into an eBook, free to download, used Social Media Channels to update the community and to invite for talks and sessions with invited guests and companies, such as Google, YouTube, Facebook, tuenti, Nielsen BuzzMetrics and Synthesio amongst others. The eBook was created in with the standard electronic publishing format ePub, making it available for iPad, Amazon Kindle, Smartphones and any other eBook Reader available on the market. Martin’s considerable talents go beyond his extensive knowledge of the digital landscape. In my experience from having worked with him in corporate training, I have seen how he has consistently and enthusiastically combined his expertise, his collaborative commitment, and his ability to organize, adapt and communicate his knowledge. He is a true change catalyst. 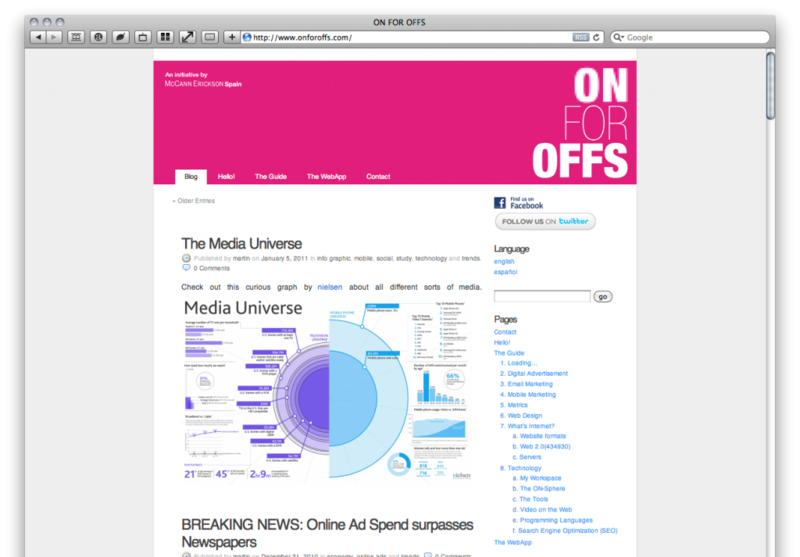 The English and Spanish Blog www.onforoffs.com (not active anymore) accompanied the ongoing training sessions with multimedia contents, tutorials and updates. Besides that, I also developed a Web Application for mobile devices, giving the user a quick access to recent posts and contents on the Blog. Special thanks to UM Spain – Curious minds for surprising results and ADN – Ayuda al desarrollo de negocio for their collaboration in creating the chapter Channelpedia. A chapter that was added to the digital edition of the book, explaining over 45 different paid, owned and earned media channels, their benefits and how they integrated with other on and offline channels for maximum marketing impact.